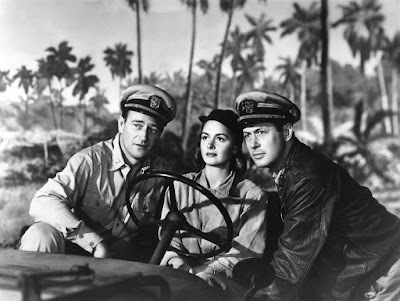 They Were Expendable (1945), starring John Wayne, Donna Reed, and Robert Montgomery, is one of the 1001 classic movies you should see. Each Monday, I'm going to recommend a classic movie you should see (for the reasons behind the 1001 series and reviews of earlier films covered go here). August's theme coincides with TCM's Summer Under the Stars, a month-long film festival that celebrates the talents of some of old Hollywood's most beloved actors with 24 hours of their best movies. This week's selection is director John Ford's World War II drama They Were Expendable (1945) starring Aug. 22 honoree Robert Montgomery. They Were Expendable tells the story of Lt. John Brickley (Montgomery) a Naval officer who is stationed in the Philippines at the start of World War II. Brickley believes his squadron of PT boats can be used for combat missions against the Japanese navy, which is initially met with mockery from the local military commanders and his second-in-command, Lt. Rusty Ryan (John Wayne). Those attitudes change when the PT boats prove to be very effective during a brutal Japanese invasion of The Philippines. However, the loss of boats and men begins to mount as the Navy relies more heavily on the undermanned PT boat crews. They Were Expendable is based on a book by William L. White that tells the story of a real PT boat squadron in the Philippines during 1941 and 1942. MGM acquired the rights in 1942, and producer Jim McGuinness and screenwriter Frank Wead then worked hard to convince director John Ford to make the movie. Ford was initially reluctant. He felt the documentaries he was making with the Navy Photographic Field Unit like the Academy Award-winning film, The Battle of Midway, were more important than a Hollywood feature with big name stars. Ford finally agreed to make the movie after working with John Bulkeley, who was the basis for Montgomery's character in the film, during the D-Day invasion. They Were Expendable was Montgomery's first film after his service in World War II. The actor volunteered for the US Navy after the Japanese invasion of Pearl Harbor, and he quickly rose through the ranks becoming a lieutenant commander and participating in the D-Day invasion. Montgomery had actually commanded a PT boat on Guadalcanal, and his experiences in combat inform his sensitive performance in They Were Expendable. Montgomery begins the film as an ambitious forward-thinking Naval officer who frequently butts heads with his superiors and the men under his command, but he ends the film as a somber combat veteran who has sacrificed too many men under his command to the ravages of war. 1. Battle scenes. This movie was filmed on location in the Florida Keys with the full cooperation of the Navy. This shows in the battle scenes, which are some of the most exciting naval action ever filmed, as the small PT boats dodge the large Japanese destroyers. 2. Anti-war message. They Were Expendable isn't an anti-war movie in the style of All Quiet on the Western Front (1930), but it doesn't shy away from depicting the high price that Brickley and his men pay for their service to their country. This is sharply contrasted with the privileged lifestyle of those with a higher rank, like Gen. Douglas MacArthur, who in one pointed scene, is shown summoning the weary PT squadron to evacuate him, his family, and a group of VIPs from The Philippines. 3. Direction. Most of They Were Expendable was directed by John Ford, but, when he broke his leg after falling off a piece of scaffolding, Montgomery directed a few scenes in his absence. The actor later went on to direct five films, including two interesting noirs, Lady in the Lake (1947) and Ride the Pink Horse (1947), and The Gallant Hours (1960), a depiction of the battle of Guadalcanal starring Montgomery's good friend James Cagney. 4. Reed. The actress gives a fine performance as a nurse who has a fitful romance with Wayne's character. It was the first of her many girl next door roles like Mary Bailey in It's a Wonderful Life (1946). Director John Ford and Donna Reed on the set of They Were Expendable (1945). Other critics: They Were Expendable has an 89 percent fresh rating at Rotten Tomatoes, and Leonard Maltin calls the movie a "moving, exquisitely detailed production" that is "one of the finest (and most underrated) of all WW2 films" in a four star review for his Classic Movie Guide. Critics in 1945 were equally enthusiastic. The usually unimpressed The New York Times critic Bosley Crowther probably ran out of typewriter ribbon in his effusive praise for the movie. "Mr. Ford, and apparently his scriptwriter, Frank Wead, have a deep and true regard for men who stick to their business for no other purpose than to do their jobs. To hold on with dignity and courage, to improvise when resources fail and to face the inevitable without flinching - those are the things which they have shown us how men do. Mr. Ford has made another picture which, in spirit, recalls his 'Lost Patrol.' It is nostalgic, warm with sentiment and full of fight in every foot." Noted critic James Agee wrote a perceptive review that noted the length of the movie -- at 2 hours 15 minutes it is longer than most forties films -- while praising Ford's attention to detail in recreating the lives of ordinary sailors. "For what seems at least half of the dogged, devoted length of They Were Expendable all you have to watch is men getting on or off PT boats, and other men watching them do so. But this is made so beautiful and so real that I could not feel one foot of the film was wasted." The bottom line: They Were Expendable is very different from action-oriented World War II adventures like The Great Escape (1963) that were made in the decades after the conflict. Instead, it is a sensitive depiction of the lives of ordinary men and women who are trying to do their duty during the chaos of war. 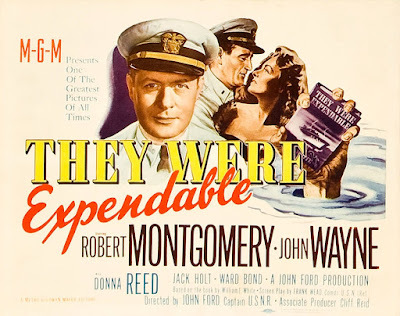 Availability: They Were Expendable will air at 10 p.m. Monday (8-22) as part of the Summer Under the Stars celebration of Robert Montgomery. The film is also available on DVD, Blu ray, and video on demand. Next week, I'll wrap up the Summer Under the Stars theme with the exotic classic Algiers (1938) starring Charles Boyer. This movie forces you to feel the frustration and futility faced by the characters. It is unforgettable in its humanity and its glorious cinematography by frequent Ford collaborator and a Navy veteran, Joseph August. The point of this great film is to make you understand both the despair of not getting to be evacuated from the Philippines, and the guilt of those who did. Supporting actor Leon Ames did a great performance as one who, after he is called to be evacuated, must give up his seat to others who arrive late. Yes, taht is a beautiful scene.